I'm not sure if I've mentioned this before, but I love goats. They are my lemons of the animal world. When I see goats, especially a herd of goats, I'm alarmingly tempted to kidnap a few. As I was driving home last week, I saw something that made me wish I had a Clyde to go along with my inner Bonnie; Pygmy goats. Had it not been for a seemingly unending flock of cyclists, I would now be sitting at the computer with a recipe-chewing pygmy goat on my lap instead of Niles, the recipe/paper spewing cat. I'm adding pygmy goat to my birthday wish-list. Right in between the "Happy Birthday!" email from Jamie Bamber and the extra week of summer. The mini goats made me think of mini tarts...mini tarts filled with something sweet and summery, like honey infused peach ice cream. After the goat encounter, I just wanted to OD on something sweet and adorable, and when I get an itch to bake something, it must be done. This ice cream is just as sensational as it's name implies. Despite the fact that honey is super-sweet, depending on what kind you use, it also lends a citrusy-floral balance to the already sweet peaches. 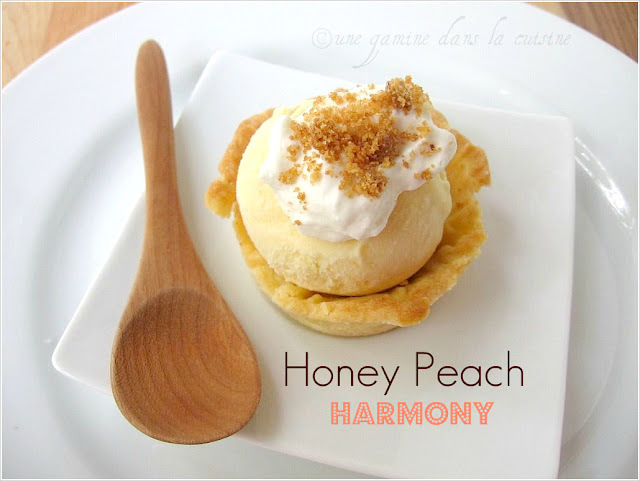 And even though I'm still in love with the lemon ice cream from last month, the honey-peach combination was a sweetly pleasant surprise. This recipe is the perfect way to usher in September, and curb any kid-napping inclinations. (Yes, I had to go there). Place the mixture into a food processor or blender and puree until smooth. Set the puree aside while you prepare the custard. Have a large heatproof bowl or 2-quart glass measuring cup on hand. In a medium heavy-bottomed saucepan, combine the milk and cream. Bring to just a boil. While you're waiting, in a medium heat-proof bowl, whisk the egg yolks and sugar together until well blended. While your whisking, slowly add about 1/3 of the hot liquid. Once it's incorporated into the egg mixture, and while stirring constantly, slowly add the remaining liquid. Pour the entire contents back into the saucepan and cook over medium heat, stirring constantly, until the custard thickens slightly. It should reach about 170 F. and coat the back of a wooden spoon. Remove from the heat and pour the custard into a heatproof bowl or 2-quart measuring cup. Immediately stir in the vanilla extract and peach puree. 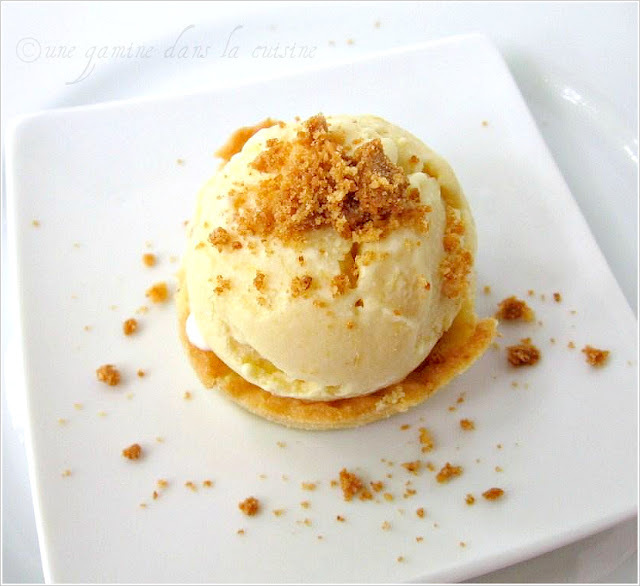 Refrigerate the custard until chilled before following your ice cream makers churning instructions. If you don't have an ice cream maker, place the chilled custard, uncovered, into a large, shallow bowl or metal container [Note: Be sure the bowl/container you're going to use has a tight-fitting lid so you can cover the ice cream once it's solid]. Place the uncovered bowl/container of custard into the freezer. Every 30 minutes or so give it a good stir. Once it firms to the consistency of a soft ice cream, cover the container and chill overnight [Note: Depending on the temperature of your freezer, this could take 3-6 hours]. Serve alone or with pie! That flavor must be amazing! Lovely. What unique flavours! I love your presentation. I love goats too! Have you seen the fainting goats on You Tube? Too cute!! They look lovely! Great serving idea... What's crumbled on top? Is it amaretti cookie? You've done another brilliant work. I love your ice cream, it looks elegant. Yum! 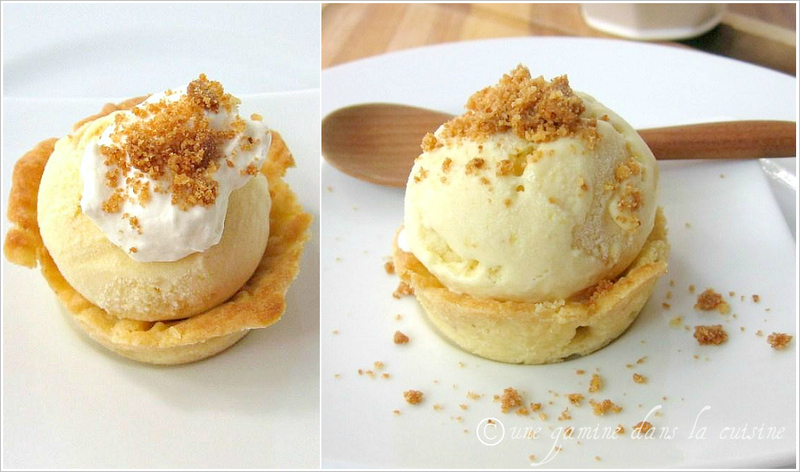 I made this ice cream last year but didn't think of the graham cracker crumbs or the tart. Brilliant! You had me laughing at your thoughts of kidnapping goats; I have that same feeling when I see french bull dogs. In other food related news - this looks amazing and oh so delicious! This ice cream looks lovely, although I still have my heart set on the lemon ice cream.